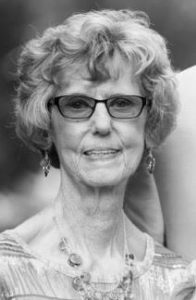 Jennilee Anderson Carter, 76, of Wildorado, died February 9, 2019. Services will be held at 2:00 P.M., Monday, February 11, 2019, at First United Methodist Church in Vega with Linda Kay Wimberley and Lane Boyd officiating. Burial will be at Palo Duro Cemetery in Wildorado. The family will receive friends at 1:00 P.M, Monday, February 11, 2019, at First United Methodist Church in Vega, prior to the service. Arrangements are by Boxwell Brothers Funeral Directors, Amarillo. Jennilee was born on February 12, 1942 to James and Ethel Anderson in Amarillo. She graduated from Vega High School in 1959. She had been the tax collector for Wildorado ISD and the Oldham County Chief Appraiser for many years. Jennilee was a member of Suzies Sunday School for many years at Polk Street United Methodist Church. She enjoyed playing the piano and organ for Sunday School and Church. Jennilee also enjoyed ballgames, spending time with her grandkids and family gatherings. She is preceded in death by her parents, James and Ethel Anderson; husband, Kenneth Carter; brother, Jim Anderson; and son-in-law, Stacy Stevens. She is survived by her daughters, Jan Davis and husband Terry, of Kennedale, TX, Terri Tharp and husband Alan, of Allen, TX, Sherri Drinnon and husband David, of Vega, TX; sister, Beth Heatherly, of Wildorado, TX; grandchildren, Erin Samson and husband Aaron, Shawn Stevens and wife Rachael, Kelsey Head, Ryne Head, Kyle Drinnon, Lane Drinnon, and Kami Drinnon; and great-grandchildren, Harper, Hayden, Hadley, Bryce, and Stacy. Sorry to hear about your Moms passing. I only knew her through PSUMC in Amarillo. You will always have her Memory. Consolations to Jenn’s family and other loved ones from one of her fellow Panhandle chief appraisers back when it was new and fun. Jen was my first cousin. I have known her all my life. Although not that close, she was always kind and gracious to me and my family. The story goes that when she was a teen, her mother, my aunt Ethel, would make her go clean grandmother Hamilton’s small house across the way. She may perhaps have resented it at the time, but it is probably one incident among many as to why she grew to become such a caring and sacrificial person. I know she was a blessing to many people. Many years ago Jennilee and I worked together at Wildorado School. What a delight she was! Intelligent, thoughtful, always a smile or laughter. I know she meant so much to so many people. Sending our prayers to the family. She would have enjoyed hearing this Mike! Thank you! Thank Nancy! Blessings to you guys!! Kay, thank you so much for your sweet words. You and Sam have a great time enjoying retirement. Thank Becky!! Moms are awesome! Treasures to be sure!!! Previous PostPrevious Ralph Lee Schultz Jr.
Next PostNext James R. “Rick” Spivey, Jr.